Free Fiddle Lessons | Dedicated to providing free online fiddle lessons and fiddle learning materials to people worldwide since 2016. Welcome to Free Fiddle Lessons! 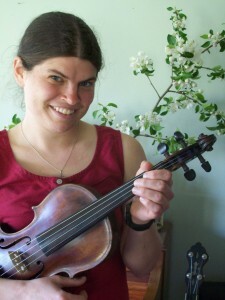 I’m Julia Plumb and I’ve been making free YouTube video fiddle lessons since 2012. I started this site because I wanted to share the knowledge I’ve gained over the years and enable anyone with an internet connection to learn to play the fiddle. I’ve been lucky enough to live in Maine where there are lots of fiddlers and fiddle teachers, so I’ve never lacked for advice, information, and tunes to learn, but I know that isn’t true everywhere, and that money can also be a barrier to learning an instrument. I believe that anyone can learn to make music, and that creative arts allow us to express our emotions, enriching our experience and making the world a better place. Please learn this music and share it widely. Adapt it to become your music and share your unique sounds with the world. I’m a fiddle player and fiddle teacher from Belfast, Maine, USA. I primarily play in a duo, Velocipede, with guitarist and mandolinist Baron Collins-Hill. I play for contra dances, concerts, and other events. I have studied with Kaity Newell and Greg Boardman here in Maine and Connie O’Connell in Cork, Ireland, as well as picking up lots of tricks, techniques, and tunes from the many, many musicians I have played music with and listened to over the years. Violin by Richard Backes of Backes Violins, 2016. Bow by Josh Henry, courtesy of Bill Dalbec.